We specialize in helping people like you start a new career tutoring English Online from anywhere in the world by providing the online TEFL training, teacher training courses, resume preparation services and the job interview coaching necessary to get you tutoring English online quickly and at the highest possible income. We provide you with all the required TEFL courses and certifications to tutor English online either as a freelance or contract teacher. All these courses are taken online, you can work at your own pace and can be completed in less than 4 weeks. Our professional resume writers will create an online tutoring focused resume and cover letter and create or optimize your LinkedIn profile to highlight your new skills. And write you a personalised script for your introduction video. We also provide online job interview coaching and with your new resume in hand, we’ll guide you through the entire job application process by showing you how to apply to get your first interview or get set up as a freelance online English tutor. Completing my TEFL course with eTefl Online was the best decision I have ever made. The support was incredible. I got my first job within and month and have been loving it ever since. A year after completing my course Jody is still always an email away to assist me in any way I need. 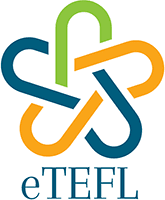 I would not hesitate to recommend eTefl Online to anyone wanting to start a career as an online ESL teacher. I'm currently in my 17th year as an editor and communications manager and in my comfort zone. I decided to contact eTefl Online and Jody answered all my questions in detail. He was professional and I became excited that this could be a viable career change. I dealt with Nadine too, my tutor and impressed that within minutes she would respond to my emails. Dealing with eTefl Online has been wonderful as they are people driven. "How to Get Hired as an Online English Teacher" video course. We regularly present free live webinars and if you would like to attend one, please join our mailing list to receive notifications on when the next one will be held. In the meantime, you can watch a recording of our latest webinar by clicking on the button below. The eTefl Online website is very user-friendly and I have had no problems at all enrolling for the course. The support and quick response time from Nadine van Eden has been great and she was very helpful in answering any questions I had. All course material is available and the it was well presented. 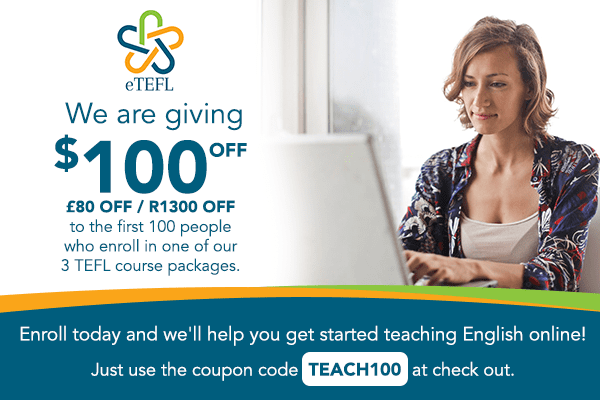 I will definitely recommend eTefl Online to anyone who is serious about teaching. I have always been intrigued by teaching English to foreign students. I came across your post on Facebook about the live webinar and decided to listen as it would feature Lauren from South Africa. It answered many questions for me that I had been pondering for a while. So I signed up to do my online course. My dealings with everyone thus far has been amazing and the service and response to questions have been prompt. The course is set out in such a way that it is easy to follow, very informative and well presented. I can honestly say that this is one of the most rewarding jobs in terms of seeing progress and how you have helped people and children. Yes, you are doing a job and earning money from others, but it is so much more than that. To see your student’s progress and receive written compliments and feedback from them shows what a difference you have made in their lives. Your work is valued. You are valued. eEnglish provide TEFL and CELTA courses in over 50 countries around the world as well as provide training and resources to aspiring ESL entrepreneurs and freelancers. The International TEFL Organization opens doors for individuals from all walks of life who want to teach English. They offer internationally recognised, globally accepted TEFL courses and certificates that will enable you to teach anywhere in the world. Our TKT and Teach English Online courses are provided by Cambridge Assessment. It is ideal for people who want to prove their teaching knowledge with a globally recognised certificate. TKT is a flexible series of modular teaching qualifications, which test your knowledge in specific areas of English language teaching. DigiNo provide our Get Hired as an Online English Teacher video course and also provide recruitment services and guidance. is a paradise for online English tutors from around the world with articles, resources and reviews to help you make the most of your online career. A well-written, professional resume is your ticket to the job you seek. Just ESL Resumes know exactly what ESL recruiters are looking for and how to make your resume stand out from the hundreds that recruiters read every day. Get TEFL certified in a few weeks and start tutoring English online from the comfort of your own home or from your laptop while traveling the world.